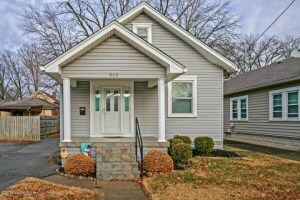 805 Packard Ave, Louisville, KY 40217 is a lovely two bedroom one full bath bungalow in the Parkway Village neighborhood. The home has beautifully updated furnace, air conditioner, windows, doors, kitchen upgrades, & insulation. The front porch provides great curb appeal and opens to the Living Room. The Living Room is accented by crown molding. The Dining Area displays crown molding and is open to the Kitchen with upgraded back splash, granite counters, garbage disposal, sink, cabinets, hardware, molding, and dishwasher. 805 Packard Ave, Louisville, KY 40217 has two pleasant bedrooms convenient to a Full Bath. New owners will love the storage space provided by the unfinished basement. The Laundry is also positioned in the basement. There is a full staircase to the attic that provides storage and potential space for future completion. Out back you'll find a sunny yard, patio, & one car detached garage. 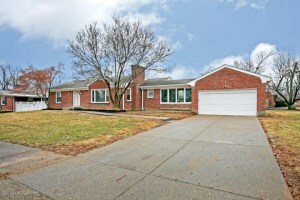 Call 502-371-1173 today to discuss this wonderful piece of Louisville Real Estate! Join our team this Sunday from 2-4 at this beautiful home for sale in Parkway Village! You'll fall in love with this 2 Bedroom, 1 Bath updated Bungalow! Call 502-371-1173 to discuss the property or to learn more about Open Houses in Louisville, KY. This Sunday January 14th, 2018 we invite you to join our team for two open houses! Both of our brand new listings will be held open. Tour 805 Packard Ave, Louisville, KY 40217 from 2-4 or 1 Canterbury Drive, Louisville, KY 40220 from 2-5! 805 Packard Ave is a beautifully updated bungalow with 2 Bedrooms and 1 Full Bath in Parkway Village. 1 Canterbury is a completely renovated 4 Bedroom 2 1/2 Bath brick ranch in Lincolnshire! Call 502-371-1173 for more detailed information about either property or visit with us this Sunday at the Open Houses in Louisville, KY.
Join our team this Saturday from 2-4 at this gorgeous listing in Brownsboro Village! You will fall in love with this five bedroom 2 full bath cape cod! Call 502-371-1173 for more information or join us at the Open House this Saturday! At Home In Louisville Real Estate Group properly valued the home and provided excellent recommendations for pre-sale improvements resulting on a sale return exceeding our expectations. The booking, documentation and advertisement brought immediate results. Definitely, I recommend this real estate organization.